The newly resurfaced junction of Euston Road and Market Street in Morecambe. More work is now being carried out down Euston Road towards New Town Square near the Travelodge. 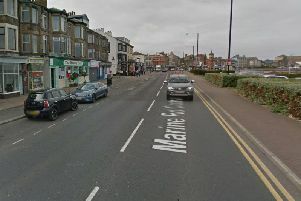 The next stage of work to improve the shopping streets of Morecambe town centre is under way. New paving, lighting and street furniture will be installed on the pedestrianised section of Euston Road and New Town Square – former home of the Morecambe mosaic. A Lancaster City Council spokesman said the aim of the work was to improve the tired appearance of the centre and make it a “much nicer place for people to visit and spend time”. Last year the first phase of the work included the new play area on the promenade near the Eric Morecambe Statue and a new zebra crossing nearby to make it easier for people to move between the seafront and the town centre. Improvements were also made to the paving on the bottom section of Euston Road and between Barclays Bank and the Post Office. The road layout at the junction of Market Street and Victoria Street was also overhauled including a swap of the taxi rank outside the Arndale with the disabled bays across the road outside the Post Office, and a new turning facility for taxi cabs outside the shopping centre. The total investment in the project, part of Lancaster City Council’s ‘Morecambe Area Action Plan’, is £900,000. The current work is being done by Lancashire County Council’s Highways team and jointly funded by the county council and Lancaster City Council. New pedestrian signs will also be installed in the town centre this spring to encourage people to explore more of Morecambe. Businesses are also being encouraged to improve their own facilities, with the outcome being an improved shopping experience that tempts more people to visit the town centre. The mosaic was moved from New Town Square in summer 2016 to a new location near Morecambe lifeboat station. What do you think of the work to improve Morecambe town centre? Please get in touch with us at The Visitor with your views.